[ARCHIVED THREAD] - BE Meyers 5.56mm Flash Hider: Commercially Available through Weapon Outfitters now! The BE Meyers 5.56 mm flash hider was designed at the request of the Navy for their SBT/SWCC, and eventually became a favorite at the Navy and Army's elite commando units. Introduced in the mid 90s, the design has remained unchanged... yet still scored at the top of the Joint Special Operations Command (JSOC) 2010 testing of flash hiders. 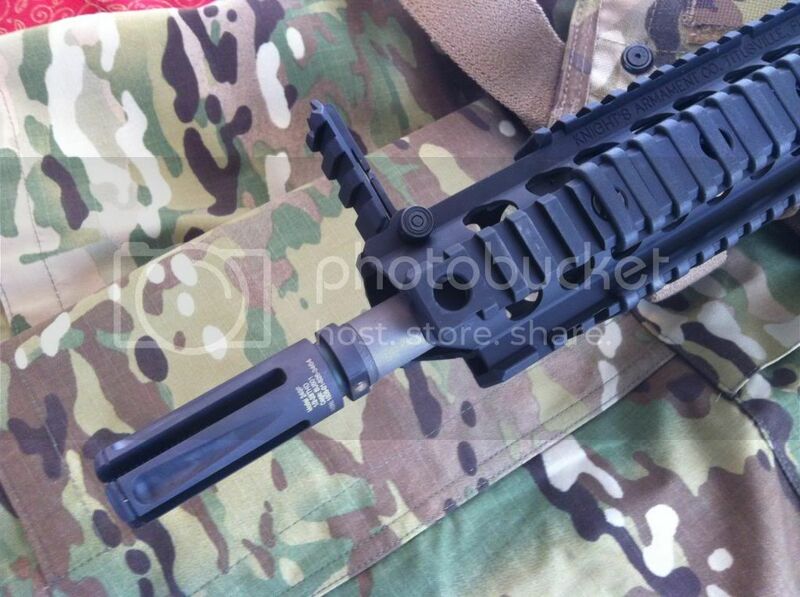 These muzzle devices are now finally available for general commercial sales to US Persons! Your 2nd link is INOP (top one works, though). SECDEF Leon E. Panetta said Wednesday [02 FEB 12] that American forces would step back from a combat role there [Afghanistan] as early as mid-2013. "Some day this war's gonna end..."
Forget the flash hider, I want a Pip Boy! Will this unit bring a 14.5" barrel to legal length? Looks like it would bring a 12.5" to legal length . Serious answer, I would think so. It's just under 3" I believe. Should work with a 13.7" barrel. I'm from Texas, what country are you from? Just measured the OAL added: adds about 2.3" to barrel length! Will it bring a 13.7" barrel up to legal length? Appears so, but would like to verify before ordering. Do you no longer offer pinning service? Was going to send my receiver and URX II rifle length rail off to you once my Infidel barrel arrives. Looks like I'll have to just order the B.E. Meyers FH? Or smith has moved to Blue Ridge Arsenal in Northern VA, so we can't offer pinning at this time unfortunately. Thanks for all the info. Just ordered the FH. Awesome, thanks for your business! You won't be dissapointed with it. This FH is definitely a piece of history, given its popularity with CAG and DEVGRU. 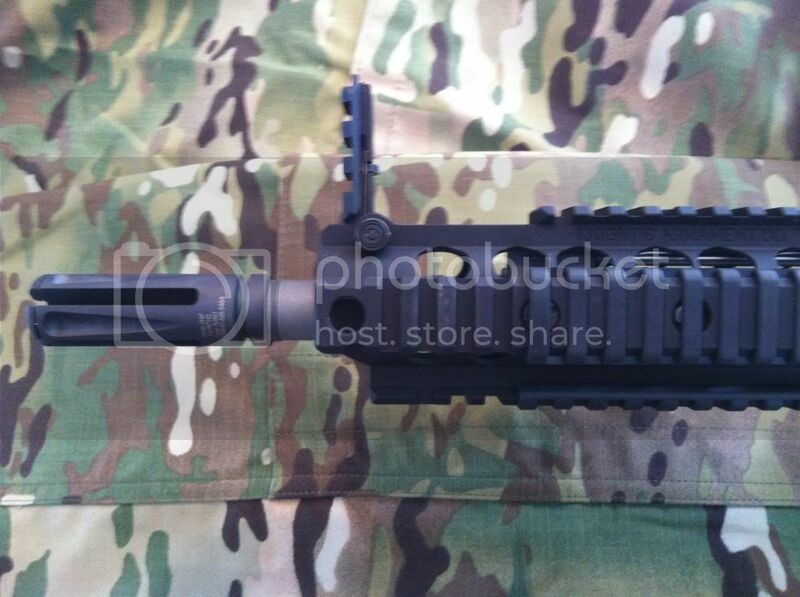 I'm really looking forward to it, still waiting on the Noveske 13.7" barrel to arrive. On another note - flash hider and trigger guard shipped out same day, thanks! Another order coming your way today. Kind of crazy to be posting pics in this particular forum, as the quality is subpar. Build is almost complete... still need a rear BUIS. Obvious choice is a KAC 600M micro, but I actually prefer the Troy sight/s.